How I picked my design and the process behind it. Quick backstory: I ran two businesses relating to one another around the same time. One was my main business and the other was a concept idea. The main one I ran from 2013-2016 and the other throughout 2015. I was testing to see how small I can limit my business and still provide a complete product. There were things that I wanted to get away from and was looking into alternatives. Well I’m bringing back both concepts of old and new and creating a sort of hybrid for my brand revival! Over the past few weeks I have been working on just that. It’s not all there but I wanted to give you a behind the scenes look at what I’ve been up to and the obstacles along the way. I wanted to have what I call a MVPP, which is a minimal viable product in packaging. What could I do that would still look professional but would use little packaging. I came up with two ideas. Why did I choose these two things? Well let’s look at one HUGE retailer: Amazon. When you get an Amazon package there are two things that nearly every package will have. The brown box with amazon prime packaging tape and a filler of some sort - bubble wrap or kraft paper. You instantly know, and so do your neighbors, that an Amazon package has arrived. The colors are subtle and don’t really scream anything, which is nice. 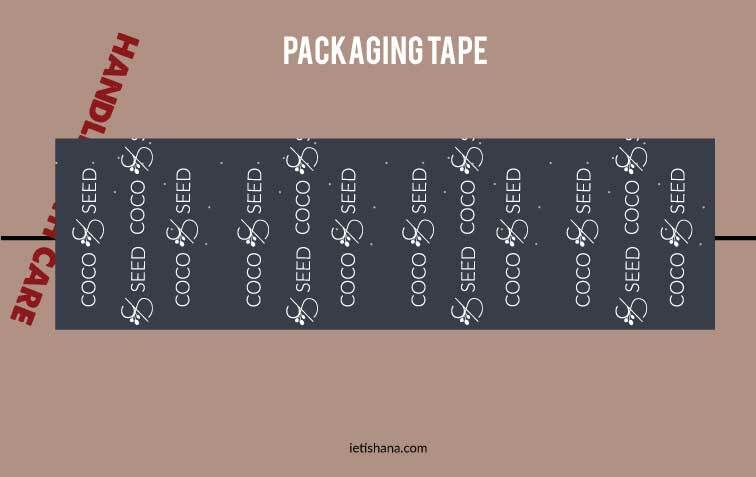 When designing my packaging tape I wanted to have a few elements on there. A neutral background, and some design elements but nothing too specific. If I were to design this all over again I may change some things but for now I’m a happy camper. Let’s go through this and how it was made. I came up with several different design iterations. The first design you do may not be the best but you have to start somewhere. I’ll let you know what I liked and did not like for each one I came up with. One big thing that I am working on this year is making a decision. A problem I have had in the past (and why this rebrand is taking me 3 years! - good grief), is that I just couldn’t make up my mind! So I am choosing to make up my mind, just pick something and go with it, because “Done is better than perfect”. Things can always be changed later, but first you need something. Design 1: I wanted to have a repeating pattern. This business will consist of a plant based, nature inspired foundation so I included plants, dots/stars and a mug. One product that will be a staple will be mugs. I have wanted to make them for years and have finally figured out the kind I want to carry in my product line. Likes: The pattern. The elements are fun and simple. Dislikes: The logo sideways and small. Design 2: This one Introduces some colors in the background. Plain white tape can be nice but for this I felt like it needed something extra. Design 3: Playing around with the background color but with repeatable elements. Played around with the dots on just half the tape. Design 4: Simplify simplify simplify. I like that it’s just the logo and decorations surrounding the icon in the center. Dislikes: It doesn’t mean anything to me and doesn’t have enough personality for my specific branding. Design 5: Circling back. By making a few adjustments it looks neutral, simple, but has some design elements. Likes: The logo straightened out and a bit larger. The color choices and the smaller mug. Design 5 is the one I decided on. If I were to add something else to it I would probably add something like a message saying “Your package has arrived” or something fun like that. Perhaps more design elements like these symbols is something I would incorporate into my next design. These symbols will appear on my other packaging, which I will share in a future post. But with this, there is a slight backdrop on the logo in the center, more white elements in the background and on the mug. It brings a bit more character. Packaging tape is a great way to make any box branded and more professional looking. I’m really excited about how this is coming together!